Well, I went and did it. I didn’t mean to, but I did it. I spent the bus fare home. How? One “buying pizza for a friend” and one trip to Army Navy for supplies. That’s all it takes to zero out the bank account lately: a pizza with wine and a months worth of batteries. And that’s it. That’s all it takes. $85.81. So I emailed my ex-boss to see if he could pay the remainder he owes me tonight or tomorrow instead of month’s end. Wish me luck! This entry was posted in capitalism, hippiecoaster, hobocoaster, Lush Life, OpHippie, Vancouver. Bookmark the permalink. Yeah, one of my windows is missing and it’s just a sheet of plastic. A space blanket will go there. And two on the ceiling to reflect the heat. Quite a good haul. Those fish grilling baskets are always overpriced, I feel. And those stove lighters are generally poor, I got through so many of them I have just given up now and prefer matches. Good advice. I wouldn’t have bought the fish griller if it hadn’t been $3.95. And matches alas are iffy. The ones I have now are so damp they don’t light easily. I had cardboard lying around in my cabin for a week, tried to use it as fire starter, and steam came off it. Everything gets damp. I was disappointed they didn’t have any oil lamps like they usually do; those give great light and I have used them for years. Next trip I get a power rig of some kind ( probably wind due to being too shady for solar) and battery, maybe a fishing rod, and we shall see what else. I might build my own shower due to not liking the one at the ecovillage. I need space to turn around in, and enough room so if slugs DO climb the walls, I don’t have to be paranoid about touching them. Ugh. My mom had a trick for getting rid of slugs. Bury little cups of beer in the ground and the slugs will be attracted and go in and drown. It works. And I figure it’s a happy death. Good luck with all that stuff. I miss the days when my bank account never bled dry. Never appreciated them properly. Thanks, I will try that! Finally, a use for Pilsner! Seriously, on the money front all I really want is to be able to buy necessities without pain. Food. Light. Shelter. Is it so much to ask? Fortunately a press release fell into my lap today, so that’s paying for the trip home. Whew! 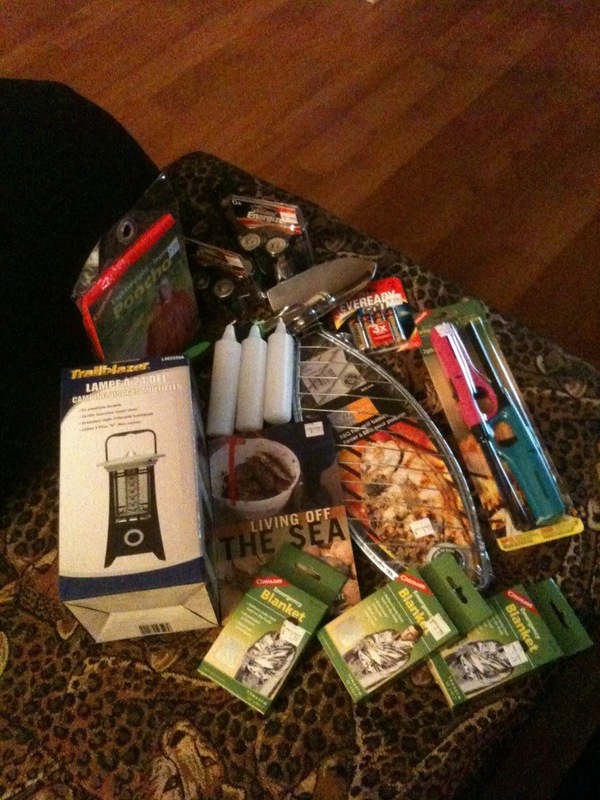 We camp a lot and I will suggest a wind up torch as a necessity cos they never need more batteries. I even have a wind-up radio which I use every day. It plays radio, has a small torch on the side and a USB charger hole in the back. I find the best way to light the fire is never to let the bugger go out. We only have a wood fire and over winter I just keep it on a low burn for months. I just let it die down and push the glowing coals to the side when I need to clean it out. Our house is damp in the cold and keeping the fire going keeps the damp out too. PS; The beer trap really does work, I use them in my veg garden. I have been away a week, but when I get back will consider your fire advice. It’s always cold there, and it’d be nice to get to cook in the cabin, if only as a novelty. I have a wind up flashlight which should be sufficient. The problem is, that it takes quite a force to wind the buggers, but the parts are all made of plastic, and they snap when they get cold. If I could find one with metal gears I’d be in heaven. I will probably break down and buy a biolite camp stove; it’s a hundred bucks, but it has a USB charger outlet, and because it’s a rocket stove it’s very efficient. Then again, for a hundred bucks I could build a rocket stove and have a built in thermal converter making energy all the time, even heating water for a bath. I would very happily drag a clawfooted bathtub to the cabin if I could heat water for it.